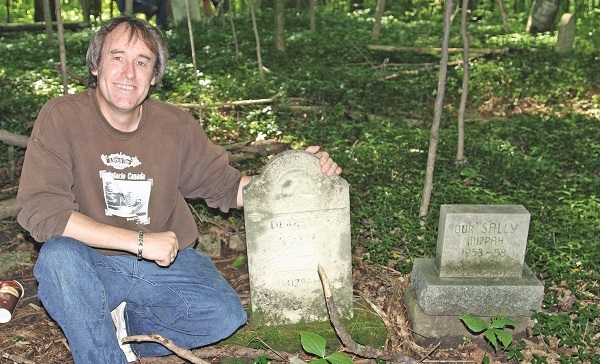 Aurora's historic pet cemetery, a quiet leafy area near Ridge Road in south Aurora, is likely to become a designated heritage space this fall. The leafy site has been for many years, and to use a pun with every possible intention, a pet project for local historian David Heard. As chief promoter of the project since uncovering many familiar names on the mossy tombstones, he has, however, a loftier goal: national designation. As The Auroran reported this spring, the land on which it sits, where generations of Aurorans buried their beloved pets and companions from the Turn of the Century through until the end of the post-war baby boom, is slated to receive heritage designation this fall, according to Marco Ramunno, Aurora's Director of Planning. For some, including many local heritage advocates, and some members of Council, it will be the first step in ensuring the public access to what could be the nation's very first documented pet cemetery. In speaking to the future of the pet cemetery, Mr. Ramunno paid credit to Mr. Heard, the developers of a significant new property development at the south end of Town, and the Town's own Heritage Advisory Committee on agreeing to preserve the site. Although details on just how the public will be able to access the relatively remote plot of land will likely be clarified as the bylaw comes closer to fruition, Mr. Heard has not shied away from presenting a vision for its future. Speaking out on Council's plans to spend $25,000 on a feasibility study for the proposed Hillary-McIntyre Heritage Park on Yonge Street between Irwin Avenue and Aurora Heights Drive, Mr. Heard said the pet cemetery property could also be a “destination” to and within the Town. “Maybe there is alternately somewhere at the entrance to the community that is a beautiful oasis, that is already at the entrance to our community from Toronto, near the Chamber of Commerce, a space of great beauty and potential, with a large cache of artefacts found in the area. Although he admits that access to the property is limited, future development could ease that access. “I believe people in Canada want to see this, not just Aurora,” he said. If the Town is to accept the challenge of securing national designation for the Aurora Pet Cemetery, they will have to prove, beyond a shadow of a doubt that it is indeed the first site specifically designated for four-legged friends in the country, according to Vanessa Hicks, Heritage Planner for the Town of Aurora. “The heritage impact assessment that was done on the property evaluated it under Ontario policies and the problem with designating a pet cemetery as a national historic site is the kind of research that would have to be done,” said Ms. Hicks. Ms. Hicks said she brought the conundrum to a leading expert in the field of heritage designations for cemeteries and there is very little precedent in North America on how to chart a course forward. Should human remains be found on the site – and Mr. Heard said his family has reason to believe a maternal ancestor of his family who owned the property in the 19th century could be buried on site – Ms. Hicks said the course could become clearer. From formal designation this fall until the surrounding development is complete, full access to the site is likely to be at least a year or two away. In the meantime, residents can have a closer virtual look at the cemetery during Mr. Heard's Sprit Walk around the Hallowe'en Season. Operating out of Victoria Hall this October, ticketholders for the annual spooky walking tour will be treated to a video tour of the site, as well as local ghostly encounters.